The Afghanistan government requires ALL foreigners to have an Afghanistan visa to enter the country. All Afghanistan travel visas require $1/day for the length of the visa. Update: May 2010: It is possible the Afghan Embassy in Dubai, U.A.E. is not issuing Afghan visas for foreigners. Please let me know if this is not the case. If you are traveling to Afghanistan on your own, without a prior invitation from a business or NGO, you can spend a day in Dubai and get your Afghanistan Tourist Visa at the Afghanistan Embassy there. You will usually receive a 30-day single entry Tourist Visa. Do NOT get a tourist visa if you plan on staying longer. 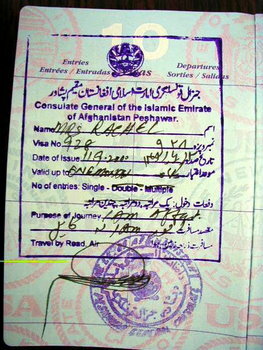 is not way to change or extend this type of visa inside of Afghanistan - strange...but true. Once in Afghanistan on your Tourist Visa, you'll have to go back to Dubai if you want to change your visa to a multi-entry non-tourist visa. I’m in the process of renewing our business visas right now as we got caught with the SINGE – VISIT visas (which translates “tourist”, though perhaps not clearly to a newbie). A VISIT visa is not renewable in Afghanistan so you will have to exit in the designated time frame of that visa. Business visas are approved by the AISA (Afghanistan Investment Support Agency) for companies legally registered in Afghanistan. The AISA main office is in Kabul but there are regional offices as well. I’ve visited the one in Kandahar. A Business Visa should be issued by an Afghan Embassy abroad providing the Ministry of Foreign Affairs in Afghanistan approves the visa and faxes documentation to the correct Embassy where you intend to collect your visa. The Embassy should issue you a SINGLE – ENTRY visa which will be renewable for a 6 month multi-entry visa once you arrive in Afghanistan. The 6 month Business visas issued in Afghanistan must also be accompanied by a Work Permit which is issued by the Ministry of Labor. Afghanistan is the "Wild West" for businesses, so we are working on getting smart business folks to include some more tips at this website soon! There are many NGO's working in Afghanistan, so this is one easy way to get into Afghanistan. You should be coming to provide some sort of humanitarian service if you go this route, even for a short visit. 1. Do NOT get a "Visit" or "Tourist" visa if you plan on staying in Afghanistan and will need to renew your visa in order to stay and work here. You WILL HAVE to leave the country in order to get an Entry Visa. If you are only visiting briefly, than obviously this is okay. 2. The NGO you are coming to visit should send a letter of invitation from inside of Afghanistan to the Afghanistan Embassy in the country you are in, as well as a permission number. This means the NGO you will be with must also apply for a visa for you in-country. This process in-country typically takes more than 2-weeks. 3. When you send that embassy your passport, they will issue your NGO Afghanistan Visa. This whole process should be allowed a 1-month lead-time to your departure from home. Typically, you'll renew every 6 months, and this can be done in-country. 4. It is NOT ADVISABLE to plan on using the Afghan Consulate in Dubai. They have become EXTREMELY RESTRICTIVE. If you absolutely must use Dubai, then plan for at least a 12-hour experience starting at 0400. Bring extra passport pictures for each person traveling with you. Once you arrive in Kabul, you must apply for an entrance card in the baggage claim area. Make sure you do this before you leave! Find out how to receive more cultural tips Here. Get your Packing List. Plan your Trip? Get the Afghanistan Planning Guide.